Choose the selection tool of your choice and create your selection on a layer. Although you don’t have to create a new layer, you should. That way, if you don’t like the filled selection, you can delete the layer, and the image or background below it remains safe. In the Tools panel, select either the foreground or the background color and then choose a fill color. Note that if you don’t have an active selection border in your image, the command says Fill Layer and the entire layer is filled with your color or pattern. 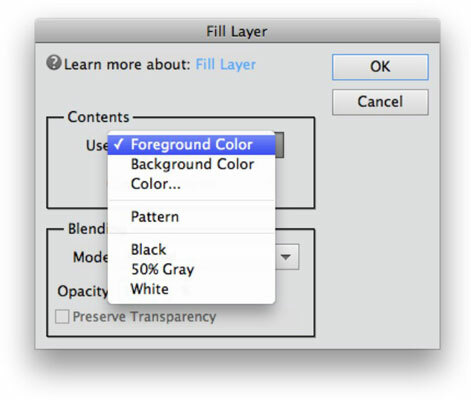 The Fill Layer dialog box appears. Choose a fill from the Use drop-down menu. You can select whether to fill with the foreground or background color. You also can choose Color, Black, 50% Gray, White, or Pattern. If you select Color or Pattern, you must complete a couple additional steps. In the Blending area, specify whether to preserve transparency. This option enables you to fill only the portions of the selection that contain pixels (the nontransparent areas). Although you can also choose a blend mode (how the fill color interacts with colors below it) as well as an opacity percentage in the Fill Layer dialog box, we don’t recommend doing so. Making adjustments on your layer later using the Layers panel commands gives you more flexibility for editing. The color or pattern you chose fills the selection.